1.) 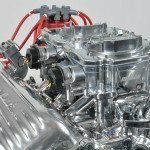 How do I select the right size of carburetor? 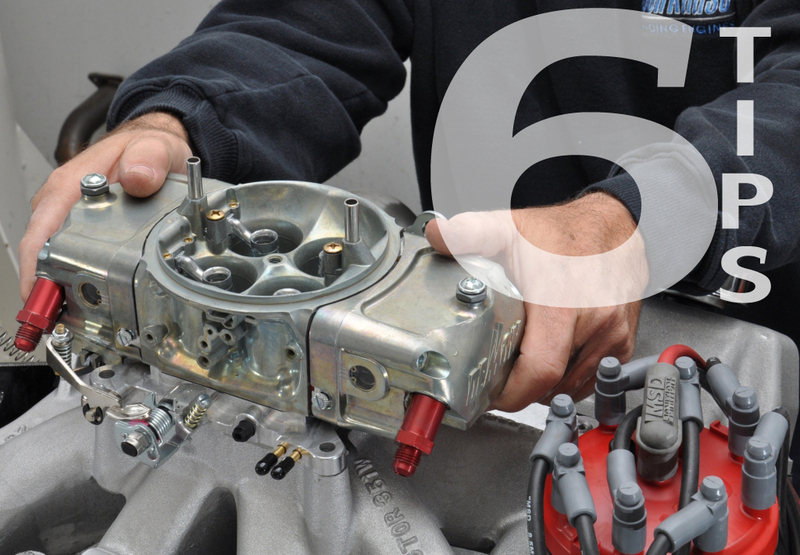 Carburetor performance is largely based on the air-speed traveling though its venturis. If they are too big the air speed will be reduced, too small and vice-versa. Probably the best instruction on carburetor choice is found in the Demon Carburetor Selection guide. It is based on camshaft duration at 0.050in of valve lift, the type of intake manifold (dual plane or single plane) and the type of transmission (manual or automatic) and stall speed. Beyond this it is always best to discuss carburetor selection with a qualified technician. Click here for the Demon Carburetor Selection Guide. 2.) 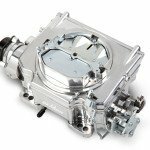 What is one of the most commonly overlooked carburetor-tuning issues? 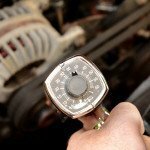 One of the greatest obstacles faced by amateur carburetor tuners is failing to understand the essentials of initial ignition timing. Ignition timing is affected by a host of elements including fuel type, mixture strength, combustion chamber shape, compression ratio, temperature and humidity. Bigger camshafts and larger cylinder heads with matched intake manifolds require increased ignition timing to promote better air velocity and maintain efficiency. Thus the carburetor is helpless in its plight if the initial timing is late or the timing advance curve is slow. These two potential timing impediments frequently exhibit poorer starting and drivability troubles. The ignition is always timed to fire the spark plug before the piston reaches Top Dead Center (TDC) in the cylinder. Firing before TDC is necessary because of the time it takes for the flame front to ignite the air-fuel mixture in the cylinder. Demon’s carburetor selection guide consists of helpful recommendations on ignition timing settings with consideration to things such as camshaft duration, valve lift, and other contributing factors to assist in the timing process. When carburetor or driveability complications occur under 3,000rpm, improper timing is often responsible for issues such as rich idle, hesitation or dying when shifting gears and stopping. 3.) 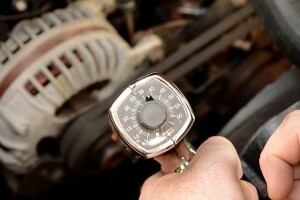 What carburetor tuning myths do tuners frequently fall victim to? In carburetor mythology probably the most misleading dogma involves changing jets in order to cure a rich idle condition. Carburetor main jets are tuned solely to achieve one thing: the best performance at fully open throttle. Jets should never be changed to correct an idle complaint. Instead the idle circuit should be adjusted and the initial ignition timing re-checked. 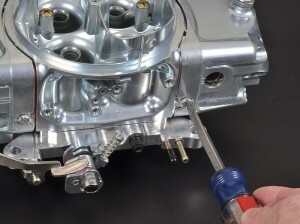 Setting the idle mixture to the highest vacuum can be achieved by using a vacuum gauge connected to the constant-vacuum port of the carburetor base plate. Slowly adjust the first idle-mixture screw. Make one adjustment only to the first screw. The adjustment should be no more than an eighth or quarter turn. 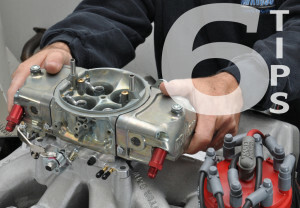 Then leave sufficient time for the carburetor to respond and move to the next adjuster screw. 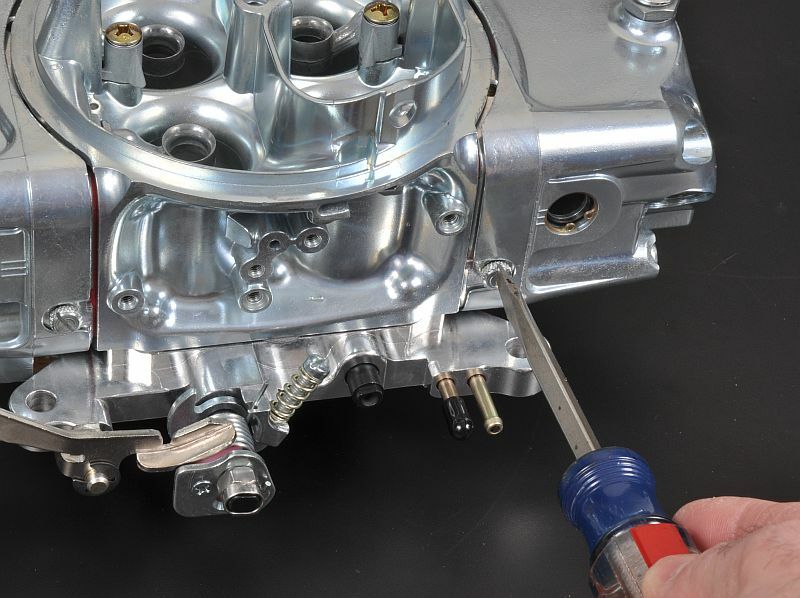 Gradually work your way around the carburetor, making just one small, slow adjustment to each screw. Careless idle-speed adjustment is the carburetor’s number one tuning problem. It causes the transfer slot to be over exposed, creating mayhem in the carburetor and confusion for the tuner. 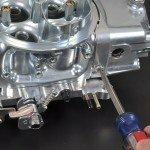 Setting the idle mixture to the highest vacuum can be achieved using a vacuum gauge connected to the constant-vacuum port of the carburetor base plate to adjust each idle-mixture screw to its highest value. Keep moving around the carburetor, adjusting each screw an eighth to a quarter turn and waiting for the carburetor to respond. Over exposure of the transfer slot at idle and insufficient initial ignition timing are the two chief causes of carburetor troubles. 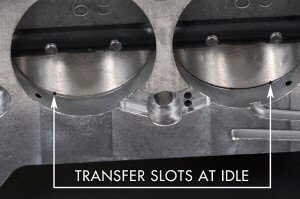 In the idle condition the transfer slots should give the appearance of a small square when viewed from underneath the base plate, and ignition timing should be double-checked prior to any carburetor adjustments. 4.) Clogged jets or incorrect idle mixture settings are often accused of causing hesitation or flooding under driving conditions, or starting and idling issues. But are there other malfunctions that could contribute to these conditions? Float adjustments are often disregarded during carburetor tuning, even though hesitation or an excess of black smoke from the exhaust could be the result of an improperly adjusted float level. After the idle mixture and ignition timing have been properly set, it is time to check the float levels. With the motor running the fuel level should be in the middle of the glass window of the fuel bowl. If it isn’t loosen the lock screw on top of the bowl and adjust the nut clockwise to lower the float level and counter-clockwise to raise the float level. Make the adjustment by one flat of the nut at a time and wait for the carburetor to respond. The ‘dry setting’ is accomplished by removing the fuel bowl, and with it turned upside down, set the dimension between the inside top of the bowl and the top of the float at approximately 0.375in to 0.0400in. 5.) 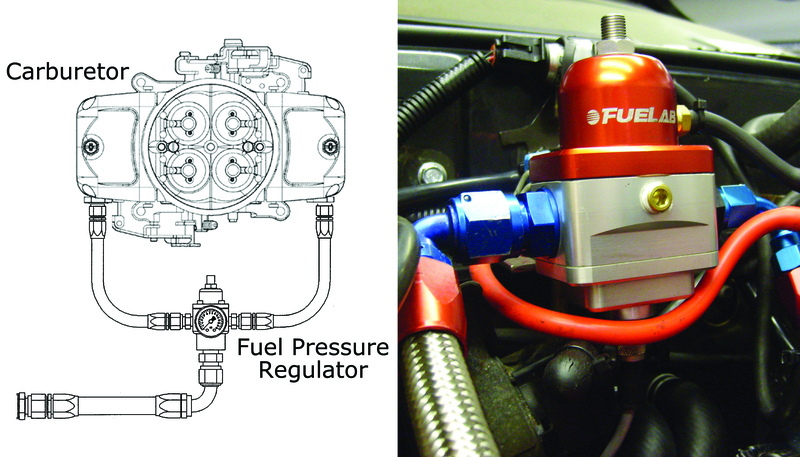 What are the rules for mounting a fuel pressure regulator? Avoid mounting the fuel pressure regulator on a bulkhead or inner fender well. Instead, position it close to the carburetor. As demonstrated by any data acquisition system, the further distance the fuel pressure regulator is mounted from the carburetor, the slower its reaction time. 6.) 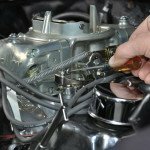 After carburetor tuning what final steps should be made before hitting the road? Always start the engine and check for leaks before closing the hood. Better to repair a leaking fuel line fitting or a malfunctioning float level than to witness later the paint being burned off an immaculate hood!